The Swan House is an excellent example of the Second Renaissance Revival style and represents the architectural and decorative tastes of affluent citizens in the late 1920s. Built by Edward and Emily Inman, heirs to a cotton brokerage fortune, the house was designed by well-known Atlanta architect Philip Trammell Schutze in 1928 and decorated by Ruby Ross Woods of New York. 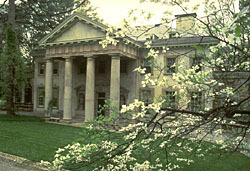 Swan House and its gardens are together considered Shutze's finest residential work, in which he adapted Italian and English classical styles to accommodate 20th-century living. The house is set on a rising slope and presents an Italian Mannerist facade complete with double stairs descending on either side of a cascade. Baroque inspired lawns, stone obelisks and retaining walls, and two stone fountains are other Renaissance elements found on the grounds. The name of the house is drawn from the swan or bird motifs that grace many of the interior rooms. The interior of the house is as elaborate as the exterior and features five rooms of distinction: the entrance vestibule, the entrance hall, the library, the Morning Room and the Dining Room. Other rooms include four bedroom areas, a sitting room, a full basement and an apartment in the attic. Of the two impressive exterior facades of Swan House, the west facade facing Andrews Drive that is the rear of the house is the more impressive of the two, being strictly Italian in derivation, although not imitative of any one architectural monument of the past. Symmetrical in every way, the facade has a central doorway at the top of a double winding staircase. Heavily framed, the door is topped by a segmented pediment supported on scroll brackets with sculptural decoration at its apex. The east facade serves as the main entrance and is English Palladian in origin. With its four-columned portico, it reflects the characteristic severity of the main entrances to this style of house. 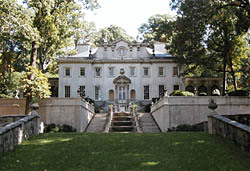 In 1966, the Atlanta Historical Society purchased the Swan House and most of its original furnishings, which range from 18th-century antiques to 20th-century objects. The house opened to the public in 1967. The Swan House is located at 130 West Paces Ferry Rd. in NW Atlanta. It is owned and maintained by the Atlanta History Center. Tours are generally available daily from 11:00am (1:00pm on Sundays) until 4:00pm, although during the current renovation of the interior, these times are subject to change. Please call 404-814-4000 or visit http://www.atlhist.org to obtain the most up-to-date tour information.